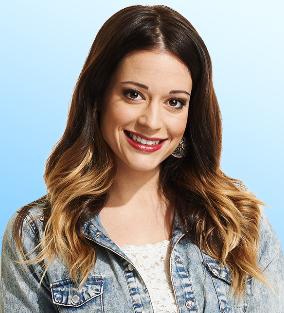 Anick Gervais was the first houseguest evicted from Big Brother Canada season 2. Poor girl, she went in with so much positivity and energy and ended up only lasting a week. ‘Tis the Big Brother game. In the first HoH competition Anick was the first houseguest to step off the ice. When current HoH, Paul, decided to make his nominations, one could only think that that was one of the reasons she was put on the block. She was placed next to Andrew and things were not looking good for her. The PoV competition was more of a muscle than energy game and Andrew ended up being the victor – meaning Andrew would inevitably take himself off the block and someone would go up in his place. That person was Ika. In true Big Brother Canada fashion, the houseguests united against a single person and voted out Anick unanimously 11-0. The day after her eviction I had a short chat with Anick. You always wonder if optimism/positivity plays a part in the demise of someone so early in the game. Too trusting maybe? Jes: Playing the Big Brother game often leads players to lie and omit stuff about their lives outside of the house. Did you feel like any of the houseguests were being dishonest about their outside lives? Anick: I think a lot of people were withholding information. I’m not sure people were actually lying about things in their lives, like go out of their way to lie, but I am not a very good judge of character because I see the good in everybody which is not always a good thing. So, I’m not really sure if they lied. Jes: As we are all aware, you are very big on energy, feeling people’s energy etc. Based on the time you spent with the other houseguests, who do you think had the best energy and who had the most toxic? Anick: The best energy would probably be, Kenny’s energy was really good, Jon’s energy was really good. I really enjoyed their energies. And the worst, most toxic, would probably be, obviously Ika’s and Neda’s…and Andrew needs some hugs for sure. So obviously she had kind of a handle on who the house devils were. She’s not completely blind. One of the new additions to the show this year is a half hour after show called The Sideshow. Host Arisa Cox, last year’s runner up Gary Levy and the yell-talker Peter Brown sit around and talk about the show and the contestants and then do a little interview with the evictee. I like the set up. Gary was looking all glam (as usual) and Peter was salivating over all of the girls. He noted that he thought Anick was hot – and she was coming on the show…so it leads us to wonder, does Peter have game? Jes: You were the first ever houseguest on the Sideshow with Arisa, Gary and Peter – so that’s pretty exciting. On the show Peter spoke about how hot he thought you were. I was just wondering if there was any point during or after the show that you felt like Peter was hitting on you. Anick: I thought Peter was really nice. I loved Peter’s energy. He actually made me feel so much better when I got on there and he gave me more positive energy because I definitely needed more positive energy. So, I’m not really sure if he was hitting on me, but he definitely made me feel great. Note to Anick – Peter actually doesn’t have great energy. We all know this. Peter is kind of a D. Peter was being nice to you because he wanted to get in your pants. Better luck next time Peter. That is all she wrote for Anick. Good luck spreading great tidings of good energy girl.